The Guest House is an early Saskatchewan Homestead log house that was originally built in the 1940’s. It was completely restored and renovated in 1999-2000. 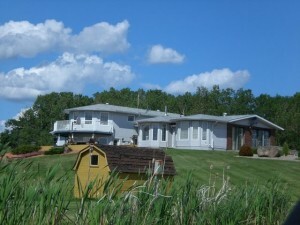 The Guest House is fully inspected and accredited by the Saskatchewan Country Vacation Association. Across the road from the Guest House is a 5000 acre grain and cattle farm, with a beautifully landscaped yard, where your host resides with her family. The farmyard was recently featured in the television series “The Prairie Farm Report.” Tours of the farm are available with prior arrangements.